Truffled Peaches are going to change your life! From Southern Italy, these peaches have an amazing bright crisp flavor that is both familiar and surprising to your palate. 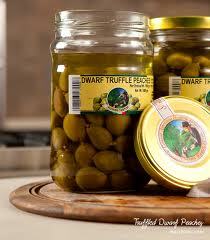 The familiar sweet sour pickle is bolstered by just enough truffle to tease your senses. The size and texture is familiar; crisp like an un-pasteurized olive or cornichons, the size of a caper berry or Cerignola olive, but with no pit and with a sweet sour rather than salty flavor. These peaches have just enough truffle flavor to let you know that this is a truffled product, but not too much to over power the dish that you are using it on. They add a pleasant crunch and acidity to any salad, garnish or condiment and at the same time perfume your dish with the pleasant aroma of truffles. You can chop them into a vitello tonnato, slice them into a salad, serve them in an aphrodisiacal dirty martini, eat them whole when the chef isn’t watching… you can think of more uses than we can. Give this unique product a try!